Poplar trees are easy to grow and care for, according to "Complete Trees, Shrubs and Hedges" by author Jacqueline Hériteau. Because of their vigorous growth, poplars are used to repopulate ruined forests and are used for a variety of commercial applications. There are a number of poplar trees to consider, though all trees are fairly similar in their growth, reproduction and appearance. Poplar trees fall within the genus Populus. This genus encompasses roughly 35 species of trees throughout the northern hemisphere. The name Populus is a Latin word meaning "multitude," and refers to the concept of the tree being a "tree of the people," as it is easily cared for and grown. Poplar trees are also called cottonwood trees and aspen trees. The leaves of trees within the Populus genus are spirally arranged, meaning that they whorl around the twig or branch to which the leaves are attached. Poplar tree leaves are shaped like rounded triangles and possess a long petiole, or stem. Leaf size varies greatly, even on the same tree, according to "Trees of North America," by C. Frank Brockman and Rebecca Marrilees. Poplar tree leaf margins are often dentate, meaning the edges appear to have large saw-toothed patterns. The poplar tree genus is separated into six subgenera. The subgenus Aegiros, or the black poplars, contains trees found in temperate regions of North American and Europe. It includes, but is not limited to, the Eastern Cottonwood, Populus deltoides. The subgenus Populus, or the white poplars, are found in cooler regions of temperate climates throughout the northern hemisphere. It contains, but is not limited to, bigtooth aspen, Populus grandidentata, and the quaking aspen, Populus tremuloides. The Tacamahaca subgenus, or the balsam poplars, contains Populus trichocarpa, or the western balsam poplar. The Tacamahaca poplars are found in the cooler regions of North America and Asia. Section Leucoides contains, but is not limited to, Populus heterophylla or the swamp poplar, and are found in the warmer parts of temperate North America and Asia. The Turanga subgenus is found in subtropical to tropical portions of Asia and Africa. The Turanga subgenus contains Populus ilicifolia, or the Tana River Poplar. The Populus subgenus Abaso is referred to as the Mexican poplar. These trees are found exclusively in Mexico. This subgenus contains, but is not limited to, Populus mexicana, or the Mexican poplar tree. Poplar trees thrive in moist areas with plenty of drainage, according to the Ontario Extension Office. Poplar trees prefer a slightly acidic pH level but will tolerate neutral and mildly alkaline pH level soils, also. 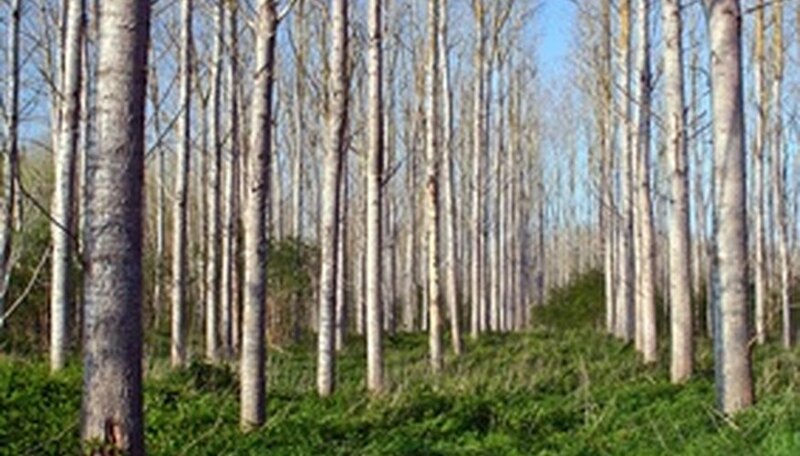 Poplar trees thrive in full sunlight and are shade intolerant. Poplar trees are dioecious and unisexual. Trees are either male or female. Pollination, which is the sexual reproduction of trees, occurs with help from the wind. Once pollinated, the female flowers grow into a green to reddish brown capsules that contains the seeds to start new trees. Inside of each capsule are a number of light brown seeds with long, wispy white or gray hairs. When the capsule is opened, the hairs aid the seeds by carrying them on the wind to a new location.